MARVEL LEGENDS WWII ULTIMATE CAP LOOSE CONDITION. (Ect with highest price prevailing as 1st price). MARVEL LEGENDS HIT MONKEY WAVE ULTIMATE CAPTAIN AMERICA FIGURE FREE SHIPPING! 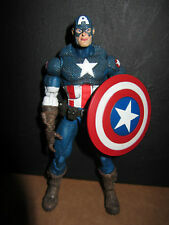 Marvel Legends Toy Biz Ultimate Captain America. Condition is Used. Shipped with USPS Priority Mail. Excellent condition and display only. Stored in a clean smoke free environment. USA shipping only. I am selling because I recently moved and need to downsize my collection. Marvel Legends WW2 Ultimate CAPTAIN AMERICA 2 pack LOOSE Hasbro wwii mcu Chris evans . Condition is Used. Shipped with USPS First Class Package. Marvel Legends Ultimate Nick Fury And Ultimate Captain America Duo Box Set. Interchangeable parts. By Hasbro.Condition is New. Box has slight dent on corners and has price tag on top of box as shown in picture. Never taken out of box. This will also affect the size of the head. HELLO MARVEL LEGENDS & SELECT Fans! All Molds and Casts are made in a pressure Tank to ensure the best quality casted results! These CAST take paint very well and you can easily cover the cast with your paint. marvel legends universe Ultimate Captain America Hit Monkey new sealed lot of 2. Condition is New. Shipped with FedEx SmartPost. What you see is what you'll get. From a smoke free. Boxes are in very good condition. This item is an out of production collectible from 2012. In great shape as pictures show! From a smoke free collection. What you see is exactly what you will get. Marvel Legends ULTIMATE NICK FURY & ULTIMATE CAPTAIN AMERICA 2-Pack New NIB. Condition is New. Shipped with USPS Priority Mail. Toybiz Baron Zemo. Walmart exclusive. This is for a Marvel legends. No broken parts. Complete with accessories. From Hasbro MARVEL LEGENDS. Safety Warning: This Product is for Adult Collectors ONLY. Mint On Card. Card Has Minor Shelf Wear. Hit Monkey BAF. Marvel Legends. Ultimates Box Set. This service. Captain America Marvel Legends Lot! Face Off, Red Skull, Baron Zemo & Ultimate! Lastly, Baron Zemo is also included. His gun is in its holster. The base is small so you most likely won't be able to get both to stand on top of it, but they stand well as pictured in pic 6. The clear sticks can be detached from the Face Off base and be put with the clear bottoms that I've included so you can use the entirely clear stands instead if you wish. Hi There, Up for sale today I have a Marvel Legends Ultimate Captain America Action Figure in excellent unopened condition. As always, please feel free to message me with any questions prior to buying and thank you for looking! Also, we do combine shipping, so by all means please feel free to take a look at some of our other items in our store before checking out...we have upwards of 1000 collectibles in our current inventory, so chances are might have something else that you are looking for! Bid/Buy with confidence...I am an experienced seller with A feedback, tons of return customers, professional packing and very quick shipping! Thanks Again! BOX IS IN GREAT SHAPE AND IS UNOPENED. Great addition to add to your collection, decent condition please check out the photos. You cant go wrong with this! Perfect for any fan. Check out what else I have to offer. Marvel Legends Ultimate Nick Furry And Ultimate Captain America 2 Pack Box has some shelf wear on corners. Please see all pictures before bidding. Item has never been opened and comes from a smoke free home. Thanks for looking. However, if you want the extra service, we will provide it. PR, HI, AK, APO/FPO and US Territories may incur a higher rate. • Box condition is sold as is. • We will hand select the best box condition out of our inventories. Marvel Legends Series 8 Ultimate Captain America Action figure speaks lights up. Condition is Used. Shipped with USPS First Class Package. GOOD LUCK! REFE RTO PICTURE. CONDITION NOTE.